With support from Jaguar Land Rover via its investment arm InMotion Ventures, the Arc Vector electric motorcycle (e-bike) is touted to be the most advanced e-bike in the market with pricing starting from 90,000 pounds sterling (RM480,701). The brain child of Mark Truman, the Arc Vector also comes with an integrated helmet and jacket that enhances the Human Machine Interface (HMI). Produced in a limited run of only 399 units, the Vector pumps out the equivalent of 138 hp with a maximum torque of 85 Nm at the motor and 397 Nm at the gearbox output sprocket. Range is claimed to be 436 km based on EU Reg. 134/2014, annex VII from the 16.8 kWh battery cells made by Samsung. Charging time for the Vector is 30 minutes with CCS Rapid Charging. 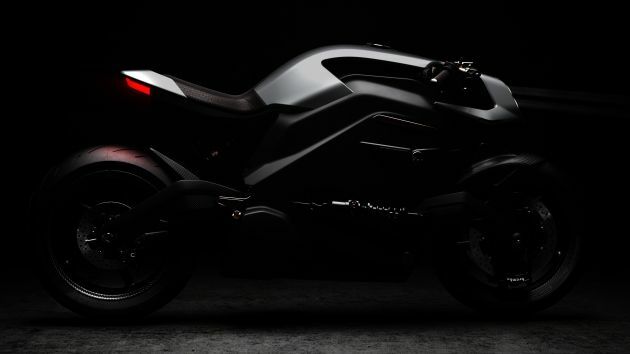 In a quest to reduce weight on the Vector, Arc designed a carbon-fibre monocoque chassis to bring the overall weight of of the e-bike to 220 kg. This is coupled with BST Black Diamond 5 carbon-fibre wheels which further contribute to the low weight for an e-bike. Of note is the front suspension, which uses hub-centre steering in a carbon-fibre swing arm with an Ohlins ILX36 shock absorber giving 110 mm of wheel travel. At the back, a carbon-fibre swing arm is propped up by an Ohlins TTX36 monoshock with 110 mm of travel. Braking in front is done with Brembo Stylema four-piston Monobloc callipers with 320 mm floating front discs while the back end uses a Brembo two-piston caliper with 240 mm rear disc and Continental Advanced ABS is standard. Arc says the Vector will do the 0 to 100 km/h sprint in under 3.1 seconds and while attain a top speed of 200 km/h. Seat height for the Vector is set at 840 mm and there are six ride modes – Road, Rain, Sport, Track, Eco and Euphoric. Complementing the Vector is the Arc Zenith helmet, developed for Arc by Hedon, giving the rider a projection-based Heads-up Display (HUD). The Arc Origin jacket, made by Knox, contains eight haptic sensors that gives the rider sensory feedback and warnings – for example, warning the rider the bike’s blind spot is occupied by vibrating on behind left or right shoulder. Expressions of interest are currently being taken by Arc with an estimated delivery lead time of 15 months which is expected to drop to six months by the end of 2019. All Arc Vectors are hand-built at its facility in Coventry with bespoke customisation an option. Wow.. this is just wow! That’s just insane amount of power for an e-bike! Please do a review on Zero e-bikes too, especially the SR.